We are a leading Manufacturer of cement storage silo and cement silo from Ahmedabad, India. We are prominent manufacturer, trader & supplier, engaged in offering a broad spectrum of Cement Silo. 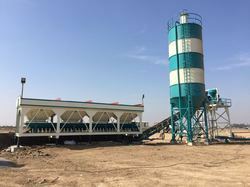 The offered cement silo is applicable in numerous engineering and pharmaceuticals industries for storing bulk material. This cement silo is accessible in varied specifications so as to meet the demand of customers. Dia of Silo. 3.4 Mtr.